A couple of months ago I discovered an amazing new planning and networking tool for RVers called RVillage. I signed up in June when there were 4,000 members. Two months later there are 10,000 members. It's a free tool that first lets you select your current location. You can then plan a trip between that location and a destination and it will show the shortest route and all the RV parks along the route. You can alter the route just by dragging the route line to another road instead of the Interstate. The RV park locations follow the new route. 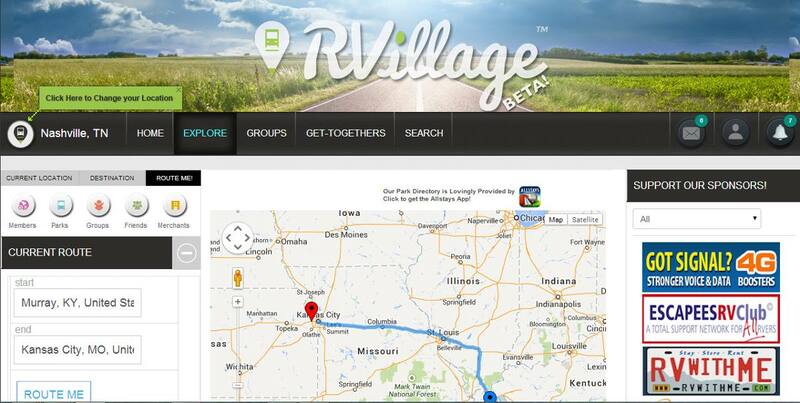 Once you locate a RV park you click on the icon and a popup shows the name of the park and address. A right mouse click on the popup opens a new tab and provides a lot more information including the name of other members that have recently stayed there or are currently staying at that park. There is also a link to the park's website. If you would like to meet any other member at that park you can send a message. Members can join groups and then organize "get-togethers" of people at the same park or nearby parks for pot-luck meals, cocktails, or whatever. The comprehensive Allstays app database is built into RVillage for locating RV parks. Park owners can join RVillage and will be able to post additional details and photos of their park. Everything I have mentioned so far is free to members and park owners. So who pays for it. Once RVillage learns about a park that has joined it then has a call center that talks to potential advertisers in the immediate area. This appeals to restaurants, maintenance services, local retailers, pizza delivery stores, attractions, etc. When you arrive at such a park, you click on your location. Now when you click on the merchants tab you will see the ads from the local merchants. RVillage has solicited members to become Ambassadors. I believe in what RVillage is doing and have agreed to be an Ambassador. My job is to recruit members and parks to join. I'll be trying to do this at every park we stay at. I am armed with business cards, joining instructions for parks, and an iPad demonstration. Tomorrow we pick up the View in Murray and head for Kanas City.